Violinist Vanessa-Mae has been awarded damages for defamation from the International Ski Federation (FIS). She was banned after the FIS claimed she qualified for the 2014 Winter Olympics at fixed races, but the Court of Arbitration for Sport cleared her. FIS apologised and has made "an appropriate" payment that the musician intends to donate to charity. 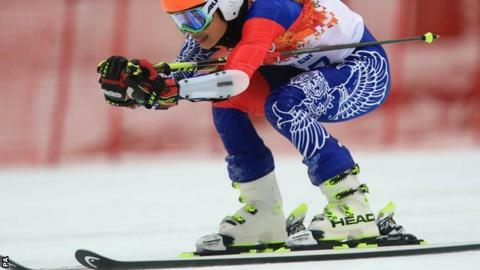 Vanessa-Mae, 37, was 67th and last in the giant slalom in Sochi competing for her father's native Thailand. Reacting to the news of her damages, she told BBC Sport: "The fact that the International Ski Federation has apologised to me says it all." British citizen Vanessa-Mae insists she will not allow the disruption to derail her bid to continue skiing and qualify for the 2018 Winter Olympics in Pyeongchang, South Korea. In clearing the musician last June and overturning her four-year ban, the Court of Arbitration for Sport said qualifying races arranged at short notice in January 2014 were allowed by weak FIS rules and five officials were banned. The panel said "a number of irregularities" occurred in the "organisation and management" of the four races which raised Vanessa-Mae's racer status. But FIS admitted that the musician and her entourage "did not in any way fix, contrive or improperly influence the result, progress, conduct or any other aspect" of qualifying races in Slovenia. The International Olympic Committee decided not to annul her result in Sochi after the ban was overturned.